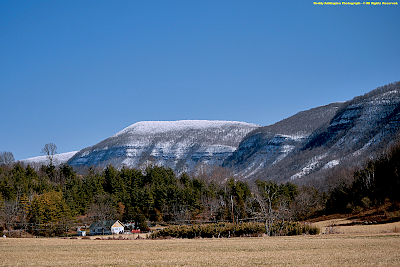 Heading 45 air miles southwest of the peak of its remnant massif of highcountry, in Lee County, Va., is a remote and little known jewel hidden amid the extended northwestern mountain flank of the High Knob Landform ( HKL ). 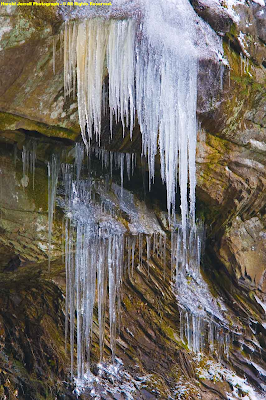 My friend & photographer Harold Jerrell, who had knee surgery to repair a severly damaged meniscus in November 2009, took a chance and made the precipitous climb up into rugged White Branch Gorge of Cumberland Mountain during February 13. 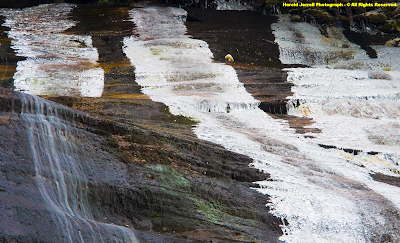 Harold knew he was taking a risk, and may should not have tried this adventure, but had been wanting to hike to the waterfalls in winter. So with cell phone in hand, to check in with his wife, he took off knowing that, "good photographs often come from harsh conditions." 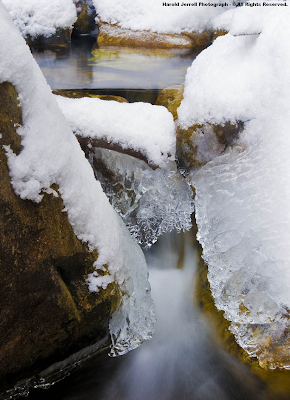 White Branch is a headwater tributary of the Martin Creek watershed of the Powell River. It rises just northeast of McLin Notch, amid an elevated hollow embedded within the southeastern slopes of Cumberland Mountain of the HKL. 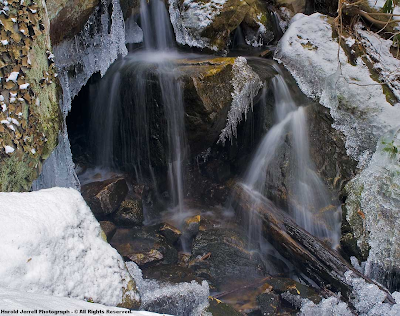 White Branch locally adjoins a contiguous 35,000+ acre tract of wildly majestic, rugged, cliff-laden forests extending into the backcountry of Cumberland Gap National Historical Park ( NHP ). 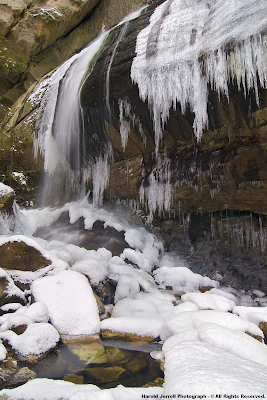 Included among this large track of unbroken forest is the 1,591 acre Martins Fork Wildlife Management and State Natural Area, in Harlan County, Ky., situated upon majestic Martins Fork of the Cumberland River. [ Martins Fork of the Cumberland River not to be confused with Martin Creek of the Powell River ]. The crest of Cumberland Mountain in this area is therefore part of the Tennessee Valley Divide, with all water draining from the Kentucky side flowing into the Upper Cumberland River Basin, while all water draining from the Virginia side of the mountain, including White Branch, flows into the Upper Tennessee River Basin. 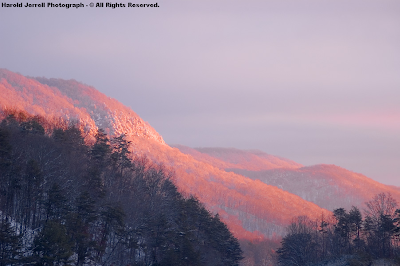 The High Knob Landform is the largest, singular mountain landform in the southern Appalachians to contribute water to both the Cumberland and Tennessee River basins. 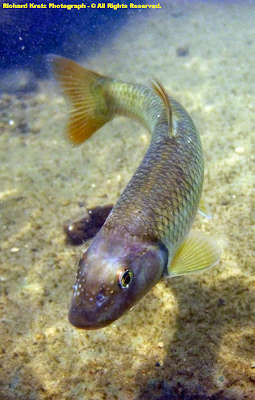 These are the most aquatically diverse river basins on the entire North American continent. 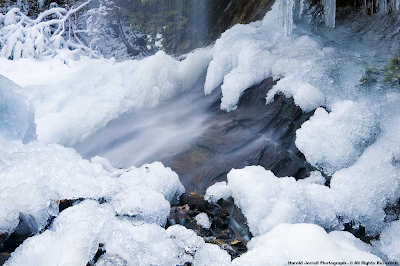 Deep penetration of light rays into the magical, frozen domain of White Branch Falls, allows backscattering to generate gorgeous hues of blueness amid this highly purified water. 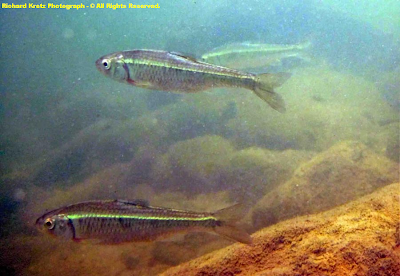 It is very important that water quality remain high within creeks draining the great High Knob Landform and Upper Tennessee River Basin, to sustain its vast richness & rarity of limited range species ( both above & below ground )! 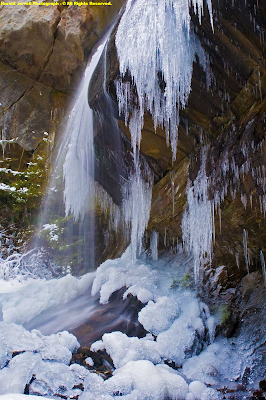 Weathering of rugged rock outcrops adds additional color to this simply wondrous setting, as varied minerals leach outward to become frozen in icicles during marvelous moments in time. 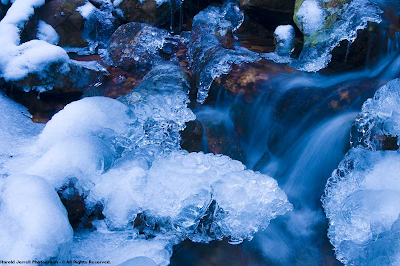 Tracing the pathways of water, ice reveals the typically unseen connection between weathering earth and all living things as its frozen moments in time highlight the vital distribution of sustaining minerals, upon which all life depends! Amid sub-freezing air the misty spray of White Branch Falls creates a special form of rime ice, coating rocks & vegetation within pristine whiteness. 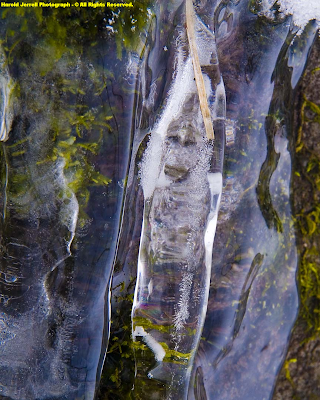 At times amid this magical world of ice the impossible becomes possible, and extraordinary, unexplainable creations arise like this incredible Monkey Face found and captured by the great eye of Harold Jerrell. trip was a gift to us all. 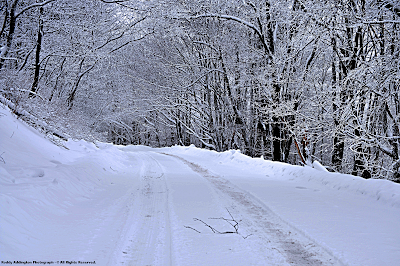 Majesty of Endless Winter Continues! 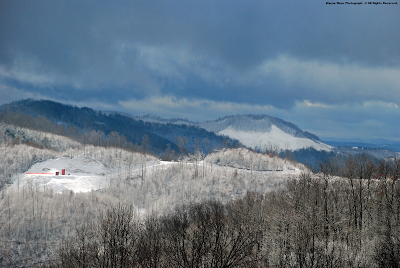 Snow got deeper, and the rugged highcountry more distinct, as the latest winter storm spread a contrasting array of conditions across the great High Knob Landform during February 15. 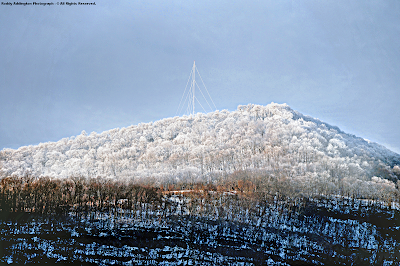 Although nothing by this winter's standard, the 2-3" of morning accumulation from Norton & Wise southwest across the High Knob Massif added new decoration and contrast to the mountain landscape. [ A low-level SSE-S air flow initially caused some light rain to fall upon the floor of Powell Valley, which shows up in brown above, as air downsloped off the adjacent highcountry. A shift to strong SW air flow then worked to enhance morning snowfall as air flowed upward through the High Knob Landform ]. 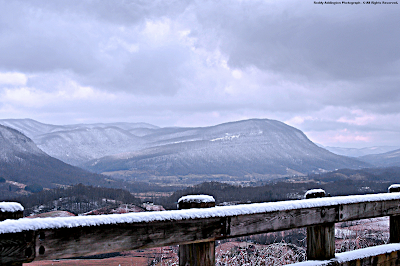 Such was the case across Lee County where valleys lying next to the Cumberland-Stone Mountain arm of the High Knob Landform ( HKL ) had all snow, in contrast to valleys adjacent to the southeast flank of the HKL ( Powell Mountain & Newman Ridge ) where downslope warming on SSE-S flow yielded little accumulation ( like occurred in Powell Valley of Wise County leeward of the massif ). Partial clearing amid a dry slot of air allowed blue skies and sunshine to penetrate into lower elevations of Lee County during the afternoon. 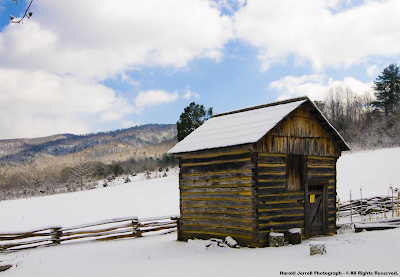 This created some beautiful settings amid the majestic mountain landscape of legendary Cumberland Gap National Historical Park. 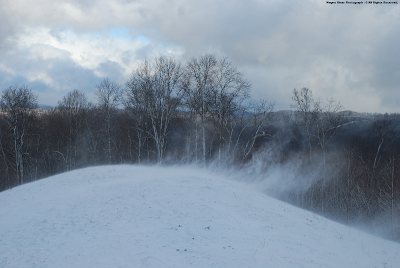 Shorter intervals of sunshine within the highlands of southern Dickenson County, added fury to the day as strong and gusty winds created blowing snow. the high pasture, holding to the tree trunks." 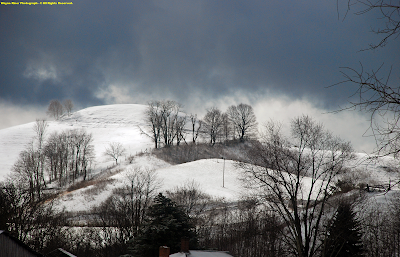 Ragged clouds and blowing snow appear to merge, when looking upward toward the high ridge tops above. [ Downsloping SW-S winds leeward of the High Knob Landform greatly reduced morning snowfall across most of northern Wise and Dickenson counties, with accumulations of 1" or less being common even up into portions of the Tennessee Valley Divide ]. 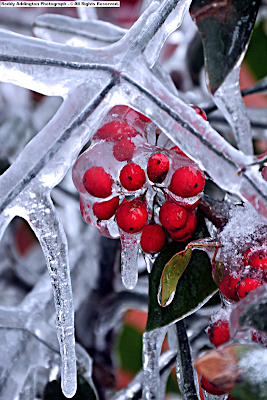 "A light snow fell and was blown by the southwestern wind. After the sun came out, we noticed snow blown from the ridge tops but still remained in sheltered areas. The ridge where the road can be seen marks the divide between the Tennessee River and the Ohio River systems. The red tank on the left is the result of a new gas well being established, and the snow covered area in the right background is a reclaimed strip mine." [ The Cumberland-Stone Mountain arm of the HKL, as noted above, also marks the Tennessee Valley Divide, which otherwise runs adjacent to the High Knob Landform and its remnant massif of highcountry ]. 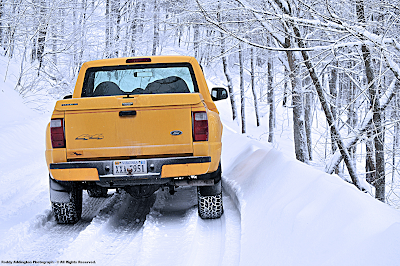 Rodney Parsons showed what conditions were like on the ground, up in Cumberland Mountain, as the new winter storm dropped its first wave of fresh powder. 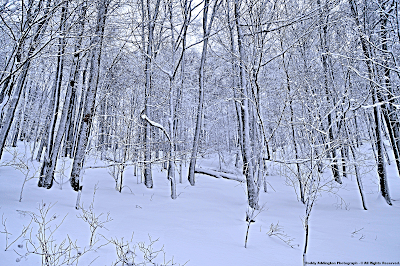 Although this has been a LONG winter, fresh powder always makes the mountain landscape look majestic! 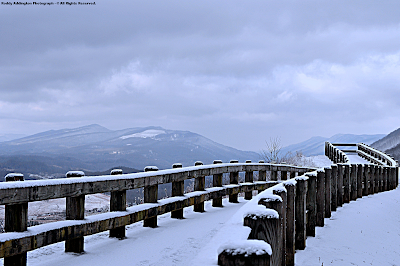 Amid the High Knob highcountry, it was another mostly cloudy day with continued flurries and snow showers. 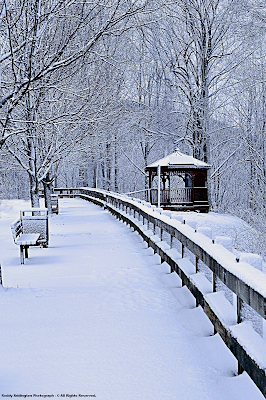 In fact, most every day during February has featured wintry precipitation, with the notable exception of part of Valentine's Day. 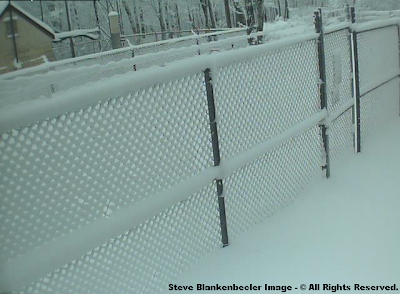 My friend Steve Blankenbecler, of VA-KY Communications, reported that snow depths were more than 2 feet deep on northern slopes of the massif ( with variable depths across the wind blown crest of Eagle Knob ). 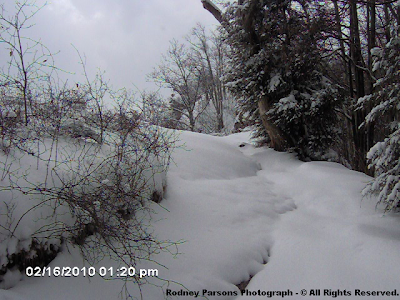 My friend Roddy Addington documented the deep snow depths with photographs taken during the afternoon of February 15. 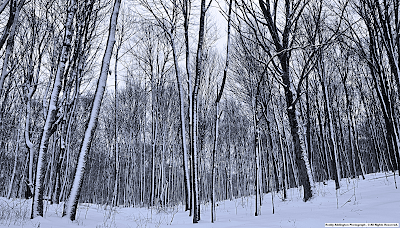 Snow plastered to tree trunks by strong winds, is only one aspect of the incredible winter domain resting above the deep snowpack. 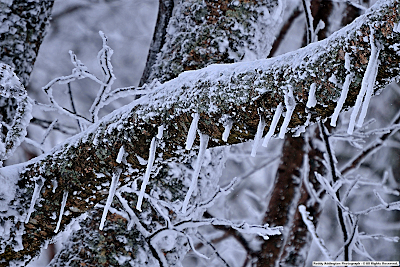 ICE has coated trees in many places within upper elevations of the High Knob Massif ever since the February 5-6 ice storm. 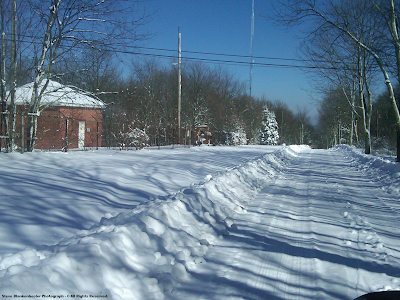 The February 9-11 winter storm followed the ice storm with 14-18" of new snow and riming across upper elevations, above 3200 feet of the massif, to partially hide the ice accumulations. and they were popping every where. 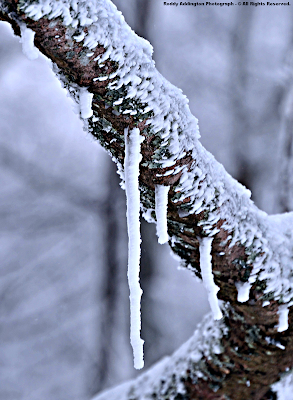 Ice straws are RIME coated icicles, which initially formed during ice storm conditions on February 5-6 as a thick layer of ice coated trees. 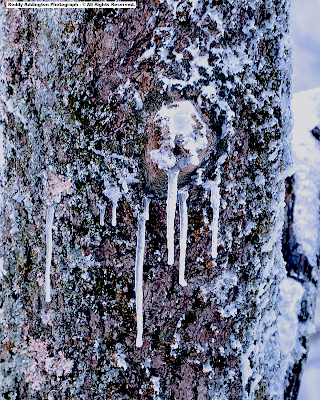 Elongating over time, as typical icicles do, they became covered with rime to mask their transparency ( i.e., making them appear white rather than clear ). [ Merely another incredible aspect of this extraordinary highcountry domain that is the sprawling remnant massif of the High Knob Landform ]. 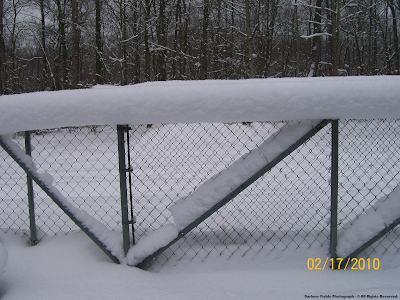 My friend Darlene Fields measured 16.0" of new snowfall as of 9 AM February 18, 2010 in High Chaparral of High Knob ( with more at higher elevations in the massif, such as below ). ( with 3-4" of new ). 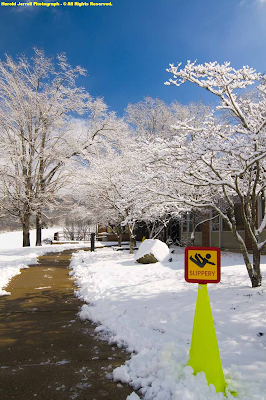 Since the time of this picture, 15-16" of additional snowfall has occurred ( as of 9 AM February 18 ). [ The top of the chain link fence above is 8 feet tall. The middle bar marks the 5 foot level. 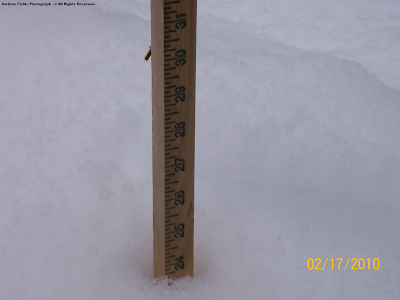 The snow depth is between 2 and 3 feet ]. Joe & Darlene Fields measured 21" of snow depth on their back deck at 9 AM February 17, with 24" measured in other places ( of course, not counting much larger drifts in the area ). [ The Fields residence has a southern exposure ]. ( with drifts visible in the distance ). 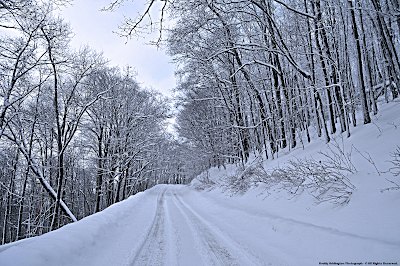 As snow continued to fall through February 17 it became a beautiful wonderland amid the lofty highcountry! 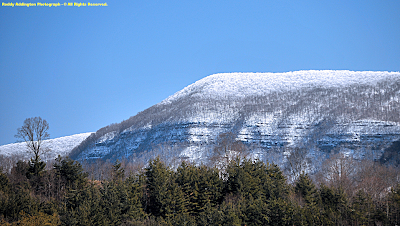 Snow depths on northern slopes of the High Knob Massif, above 3300 feet elevation, reached into the 30" to 40" range ( knee to waist deep ) during February 17-18, to match or exceed depths achieved during the great Mega-Dump storm of December 18-19, 2009. 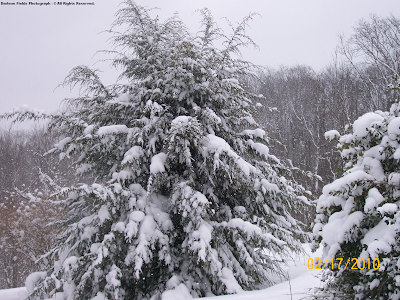 This latest winter storm has pushed 2009-10 snowfall totals into the 100" to 150" range within upper elevations of the High Knob Massif, with 105" in High Chaparral and approximately 140" on Eagle Knob. My friends Otis & Nancy Ward of the lovely Robinson Knob community have measured 19.37" in their NWS rain gage since December 1 to show how significant winter precipitation has been in the High Knob highcountry ( that with at least 1.50" of missing moisture in just the Mega-Dump event, given the 4"-diameter rain gage could not hold but a portion of that deep fall ). 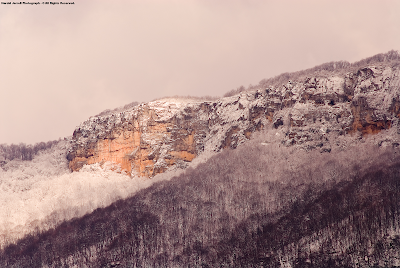 [ The above suggesting that more than 21.00" of total precipitation have accumulated within upper elevations of the High Knob Massif, above 3000 feet, since the beginning of Meteorological Winter ]. 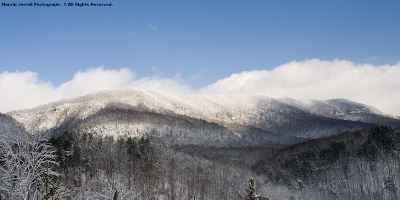 One of the most incredible things I love so much about the great High Knob Landform, and it's remnant massif of highcountry, is the unreal climatic contrasts it often generates ( which I strive to relay to you on this website ). 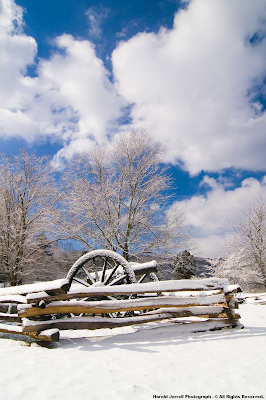 Photographer Roddy Addington captured this stunning contrast, which all must realize and truly appreciate, as the floor of Powell Valley quickly lost its sparse covering of snow into afternoon hours of February 19 ( this as 2 to 3 feet of total snow depth remained far above amid the highcountry ). 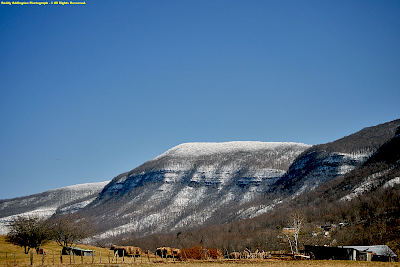 [ The High Knob Landform is thus unique in its ability to generate snow shadows both leeward of itself, across surrounding regions, and internally within itself amid depths of Powell Valley ]. 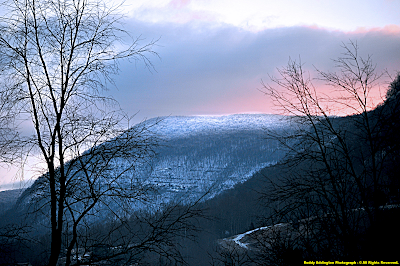 Only through realization & appreciation for what the High Knob Landform is, and represents, will we ever become complete as residents, care takers, and viewers of this most grand Appalachian landscape. From great subterranean depths ( very far beneath its surface ) to the highest peaks visible, this is a UNIQUE landform possessing world-class attributes ( the views are not bad either! ). and other aspects, in coming months.